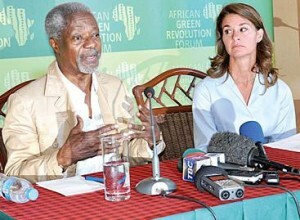 Koffi Annan and Melinda Gates Impressed by "Kilimo Kwanza"
The Chairperson of the African Green Revolution Alliance, Dr Koffi Annan and Mrs Melinda Gates, who is the Co-chairperson of Bill and Melinda Gates Foundation, have both been impressed by Tanzania's 'Kilimo-Kwanza' initiative. The two dignitaries expressed their approval during the opening session of the on-going African Green Revolution Forum which is in progress here. "I have learned that the concept means 'Agriculture First,' indicating that the country places farming at the top of its list of priorities," said Mrs Gates. She added that the initiative was Tanzania's best decision in its effort to combat poverty through empowering small-scale farmers. "Most of the agriculture projects in Africa which are financed by developed countries miss their targets because most programme managers know very little about Africa and the continent's farmers," Mrs Gates observed. She told the gathering that her foundation will invest heavily in capacity building for African farmers with greater focus on women on the continent. This approach, she said, will be based on what she has seen during her farm visits in Arusha region. "Most farm work in Africa is done by women. So when we talk about transforming the continent's agriculture sector we must place women on the top of the agenda," said Mrs Gates. She added that she has been impressed by women's farm work in Meru district. On his part, the Chairperson of AGRA, Dr Annan, congratulated President Jakaya Kikwete for seeing the importance of harnessing the small holder farmers' potential in transforming the agriculture sector in Tanzania. "It is encouraging that the country is allocating 10 per cent of its national budget to Agriculture in line with its new Agrarian Revolution of 'Kilimo Kwanza' which is in line and quite similar with the AGRA mission," said Dr Annan. He said that AGRA was reaching out to more than one million farmers in 17 countries on the continent through a number of funded projects, improved seed variety production and empowerment. Dr Annan pointed out that AGRA could easily turn Tanzania into a breadbasket for the African continent, given the country's potential as well as favourable government policies. President Kikwete officially inaugurated the AGRA Forum with a pledge to invest more on agricultural research in order to improve farm production in the country. "Starting next year we will make sure that the government finances at least two research projects in each of the agriculture research institutions in the country and the state has made major strides in this direction," the president said. Earlier on, the Minister for Agriculture, Food Security and Cooperatives, Mr Christopher Chizza said that the agriculture sector in Tanzania accounts for nearly 40 per cent of the country's total exports and provides employment to 80 per cent of the country's population.